Enable customers to buy gift cards and send them to friends via email or by post. Create an unlimited number of gift cards with different pricing models and easily keep track of all purchased certificates. Every day thousands of customers browse thorough numerous online stores to find an ideal gift for their friends, colleagues or relatives. Unfortunately, there is a high risk that visitors who are not certain about a specific present may leave your store without making a purchase. The Gift Card extension for Magento 2 easily solves the gifting dilemma by offering specially designed gift certificates which can be sent to recipients via email or by post. Once the certificate is purchased, a unique code with a custom greeting message will be sent to the addressee. 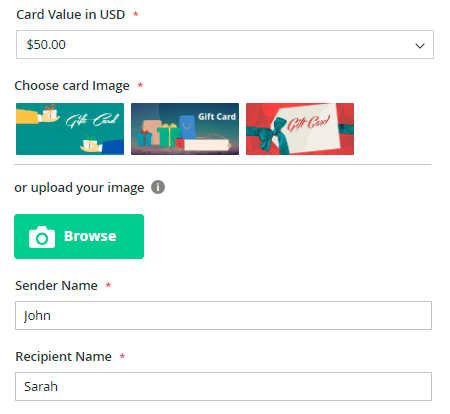 The module lets admin users create gift card products with different pricing types, use predefined card images or upload their own ones and helps them to keep track of all purchased gift certificates. Why do more and more shoppers prefer purchasing gift cards to classic gifting? According to the cardcash.com research about 50% of respondents admit that certificates let recipients select the present according to their taste. Almost 25% of consumers say that gift cards are easier to buy. NEW | Download their own card image. Specify a date of dispatch and a time zone. All gift card details will be shown on the shopping cart page. Check the certificate expiration date. See a gift card balance and an expiration date. If a customer doesn't apply a gift card code on the previous steps, it's also possible to do on the checkout page. Customers can see the gift card status, check the card balance and the expiration date. NEW| Customers can preview an email with a gift card before their making a purchase. Notify certificate recipients about their gifts: send a notification emails with a gift cards. It's possible to add a gift card in PDF format to the sending email. This option can be useful if your customers want to print a card. For example, if they want to use it in the offline store or just to delivery it personally. Let customers send anonymous gift cards. It is possible due to the flexible gift card display options. Just remove the field "Sender Email" from the list of fields a customer should fill in while purchasing. Some customers are looking for exact kinds of products they want to present as a gift. Some – are looking for ideas of perfect gifts. Why not offer them gift cards that can be applied only for particular products / categories / etc.? Flexible extension settings allow you to create or transform already existing cards in several clicks. Also, you can set different limitations according to your needs, e.g. total amount of an order or quantity of products in the cart. Add extra fees for purchase (percent or fixed). 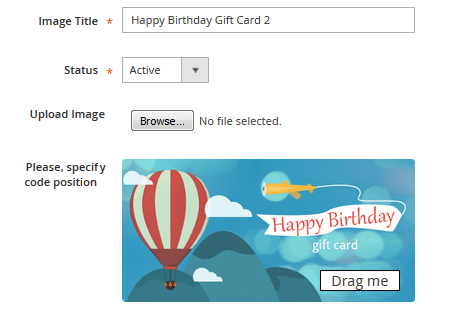 With the Magento 2 gift card extension admin users can easily manage the dispatch of card emails and notifications. Surprise certificate recipients with eye-catching gift code emails and timely inform them about the code expiration. Indicate when the expiration notification should be sent. The Magento 2 gift voucher extension lets admin users generate an unlimited number of gift codes in seconds. Simply specify the code set template as well as the coupons quantity and click the 'Save' button. All generated coupons will be displayed in the 'Coupons List' tab. It's also possible to import codes using a CSV file. 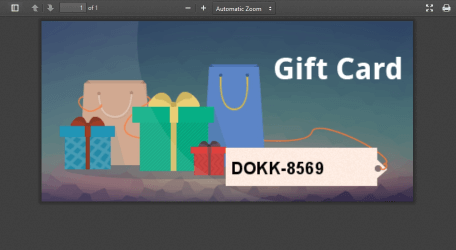 With the Gift Card extension admin users can easily manage generated codes. View the detailed order history of each particular code, change code settings and delete unnecessary certificates. Fine-tune gift card settings according to your specific requirements and choose the options that will be available to customers on the product page. Amaze customers with a great variety of gift certificate images. Upload an unlimited number of gift pictures to your admin panel or use predefined images to let store visitors choose the one they like. You can also let clients download their own images. Feeling artistic? Amasty is eager to support your enthusiasm with free packs of ready-made labels. Use drag-and-drop to choose where to place the code line. Set product types that can be purchased with a card. Let shoppers use gift cards for themselves. Create gift certificates from the backend. Apply cards to orders created from the backend. Edit gift card balance from the admin panel. Edit gift code expiration date. Write gift card code comments. Yes Amasty responds and fixes the bugs, but we have paid $249. A bit disappointing for a module where our customers cannot use multiple gift cards in checkout and have the correct discount. Fancy extension with highly flexible admin settings. I liked the free present from Amasty - the awesome set of gift card templates. It really excused me from monkey business for the start. I used the module for m1, now I've switched to m2 and taken it along. The backend works well and support is always well-timed. I run many extensions from Amasty and the quality of the code and support are amazing. The frontend works fine, though I've put a lot of work in the styling. I recommend this company to all! We've migrated to magento 2 picking up the set of plugins we used to run in magento 1. So, we've installed the gift card and were surprised by its quality. I mean, all features work as promised. And the pack of readymade cards camе in very handy. I'd definitely recommend this tool to others. – Improvement: unused product attribute 'Allow Message' was removed. – Improvement: now when you edit product from cart page or mini-cart, all previously submitted Gift Card details will load already filled. – Fix: setting 'Allow customers to use gift cards they bought for themselves' was fixed. – Fix: gift cart application on shipping and tax amounts was fixed. – Fix: cron related issues were fixed. – Fixed the installation issue that was appeared if the attribute group 'Prices' had been already in the store. Please note that this fix was applied only to new installations. If you had already installed the extension you wouldn't have such issue. – Fixed the issue with the timezone selection that can't be saved in the order. 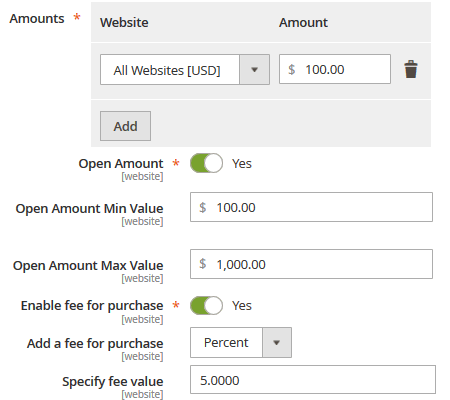 – Fixed the account creation process when an order was invoiced via API. – New: in this release we've made optional the fields like 'Sender's Name', 'Recipient's Name', 'Delivery Date' and 'Gift Card message'. Now you can choose what fields you would like to display on the gift card product page and what fields are not necessary. – New: we've added a new option. Now you can show the chosen gift card options on the mini-cart and the checkout. 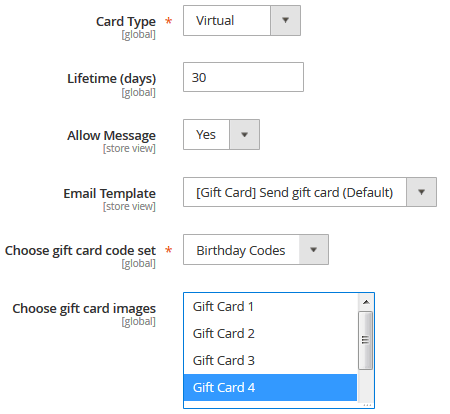 – New: we've improved the work of gift card custom options. It's also possible to display them on the cart and the checkout. – Fixed the issue with gift card discounts not appearing in Invoice, Credit Memo and order emails. – New: Gift Card now can cover tax value. – Fixes for tax calculation, invoice and credit memo. – Fix for a purchase of multiple gift carts in one order. – Set of fixes for multi-store and multi-currency environments. – Fixes for gift account creation and coupon generation.